SALINAS, Ecuador (Reuters) - Venezuelan opposition leader Juan Guaido said on Saturday he would return home after a visit to Ecuador and called for new protests next week against President Nicolas Maduro, whose government had banned him from traveling abroad. 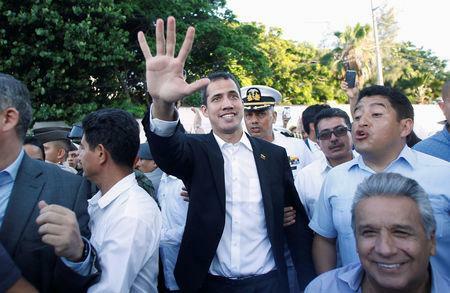 Guaido has spent the past few days touring between Latin American countries to muster support for his campaign to form a transition government and oust Maduro, whom he denounces as an illegitimate usurper. He had visited Brazil, Argentina and Paraguay after leaving Venezuela last week for Colombia to coordinate efforts there to send humanitarian aid into his country, though troops loyal to Maduro blocked a convoy of aid trucks and turned them back. "As for the next steps for Venezuelans, I announce my return home from Ecuador," Guaido told a news conference in the coastal town of Salinas alongside Ecuadorean President Lenin Moreno. Guaido did not say when exactly or how he would return to Venezuela. He is expected to leave Ecuador at 9.30 a.m. local time on Sunday, according to the Ecuadorean government's schedule for his visit. His return opens the possibility that Venezuelan authorities will try to arrest him. The Supreme Court had imposed a travel ban on him after he invoked the country's constitution on Jan 23 to assume an interim presidency, which most Western nations now recognize as legitimate. Guaido said Venezuelans should again take to the streets on Monday and Tuesday, even though Venezuela, like other Latin American countries, was celebrating the Carnival holiday. "We have little to celebrate and a lot to do," he said. Guaido has called on his international backers to impose harsher measures to pressure Maduro and after the aid convoy's failure proposed that "all options be kept open." While U.S. President Donald Trump's administration has not ruled out military intervention to dislodge Maduro, it is seen as unlikely and his Latin American allies have encouraged a mix of sanctions and diplomacy instead.